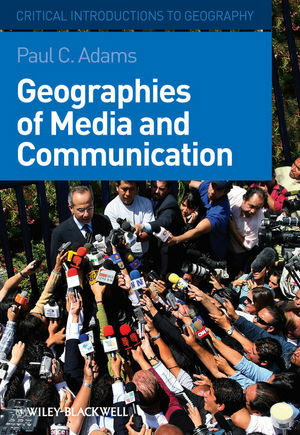 Geographies of Media and Communication systematically analyzes the relationship between geography and communication and shows how geographical approaches open up familiar and unfamiliar aspects of communication for analysis and discussion. Paul C. Adams is Associate Professor and Director of Urban Studies, in the Department of Geography and the Environment, University of Texas at Austin. His books include Textures of Place: Exploring Humanist Geographies (co-edited with Steven Hoelscher and Karen E. Till) (2001), The Boundless Self: Communication in Physical and Virtual Spaces (2005), and Atlantic Reverberations: French Representations of an American Presidential Election (Ashgate, 2007). 1. From the Spoken Word to the Alphabet. 2. From the Printing Press to the Digital Signal. 3. Communication Flows and Flowmations. 6. Virtuality and Scattered Gatherings. 7. Signs, Symbols and Signals. 10. Place and the Power of Communication. 12. Geographies of Expressive Being-in-Place. Re-interprets the cultural turn in geography as in fact the sensitization of geographers to a wide range of theories about communication.